﻿﻿﻿﻿﻿Game warden was a family friend with a quick smile, a foul mouth and a lifetime of stories. ﻿﻿﻿﻿﻿﻿It doesn’t happen as often as it used to, but sometimes the smell of lingering tobacco smoke takes me back to all the times Game Warden Grover Simpson came by our place when I was a kid growing up in Austin. Driving a green and white 1954 Chevy (this was before wardens gained full peace officer status in 1963 and got their first state-issued vehicles), Simpson would roar up our driveway and screech to a halt, his car’s long radio antenna still whipping back and forth as he opened the door and ducked his head to get out. Dressed in a dark-green wool uniform that wardens wore no matter the season, he’d be pounding on our front door in a few seconds, alternately whistling or yelling good-naturedly. Sometimes he’d wait for Mother or me to let him in, but not always, if the house was unlocked. Either way, he’d have to stoop to get through the door. Pulling his hat off as soon as he stepped inside, he’d have a smile on his face as wide as a catfish’s mouth. If Mother didn’t already have coffee ready, she’d be building a pot by the time our lanky friend blew into the kitchen. The red datebook clutched in one of his big hands really didn’t become fully visible until he’d settled his 6-foot, 4-inch frame in a chair at the kitchen table. Then, with a click of his Zippo, he’d light up another Lucky Strike. Simpson often dropped by unannounced, but we could count on at least one visit a month no matter what. That’s because Mother, an English teacher, helped him write his monthly report to headquarters. Though reasonably well-educated for the times, Simpson knew that his “country boy” way of speaking, punctuated by an innocent level of profanity that was just his normal way of talking, did not lend itself to formal law enforcement documents. The starting point for each month’s activity report would be that red datebook he always had in his car. Even though Simpson would have written down the basic who, what and when of each day he was on duty, Mother would have to interview him to glean more detail on the cases he had worked. She’d also have to translate phrases like “those little chicken----s” or “the tall ------- with the flashlight” into acceptable cop talk. When Simpson turned those reports in, neatly typed by my mother, his puzzled supervisors found they always read just like something an English teacher had written. While a Southern gentleman around people deserving respect, Simpson used terms relating to a person’s parental heritage naturally and often with no offense intended. For those he deemed not entitled to as much courtesy, Simpson kept a leather blackjack in one boot and a short-barreled .38 in the other, even though he wasn’t supposed to carry a pistol. I soaked all this in. At school I’d brag to my friends that Grover Simpson, the game warden we’d occasionally see talking about wildlife on Channel 7’s The Uncle Jay Show, had been at our house and happened to be a family friend. That had been the case since the early 1950s, when my mother worked for a time as a secretary for the Game and Fish Commission, when it was located at 11th Street and Congress Avenue in the long-since-razed Walton Building. She had met Simpson there, but as it happened, we lived across the street from him, his wife, Melba, and their two kids, Sharon and David, in a new subdivision on what then passed for the far north side of Austin. 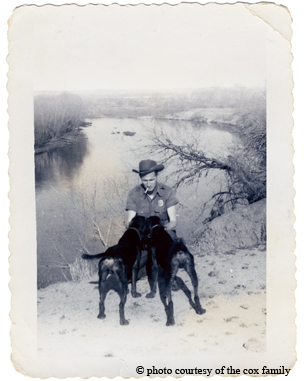 Simpson had been a game warden since June 1, 1948. Born in McKenzie, Tenn., on May 21, 1918, Simpson lost his father in 1930 and ended up in the state children’s home in Waco. He attended college in Denton, served in the Texas National Guard and spent a few months studying chemistry at Baylor University before he was accepted into the four-month game warden training program at Texas A&M Uni­versity. His first assignment was Travis County, and that, despite the trouble that would come, is where he stayed for the rest of his career. Simpson was a wonderful raconteur, and I hung on his every word. I had heard him tell it before, but in October 1971 — then a reporter for the Austin American-Statesman — I prevailed on him to let me tape-record his signature story, the time he busted future President Lyndon B. Johnson for refusing to submit to a bag check while dove hunting. The 1956 incident would threaten Simpson’s career, change the history of the Texas Parks and Wildlife Department and even figure in the 1964 presidential campaign. Here’s the back story: Capt. E.L. Sprott, then director of law enforcement, had been invited by Blanco County Game War­den Travis Gilbreath to shoot dove on a ranch where he had permission to hunt. Sprott, who had a bad leg from a crash with a logging truck, asked Simpson to drive him to join Gilbreath for the dove hunt. The three men would get in a little hunting and then close out the day checking for violators. Entering the ranch, they saw a late-model luxury vehicle parked near a stock tank, about 150 yards away. The wardens could make out four men — three of them plainly dove hunters. The fourth man wore a white waiter’s coat and appeared to have been mixing the others drinks and picking their birds. Sprott told Simpson to walk over and check their game bags. As he approached the vehicle, two of the hunters and the waiter got inside. Before the waiter joined one of the other men in the back seat, Simpson saw him throwing something into the car’s trunk (or as he called it, “the turtle”) and slamming down the lid. “I noticed you fellas shooting pretty late, and I’d like to check your birds,” Simpson told the man who had remained outside. “Well, whose ranch is this?” Simpson said he asked. “I’m A.W. Moursund, the county judge of Blanco County, and I own this ranch,” the man replied. “I said I couldn’t find anything in the law book where it said anything about the Blanco County judge being exempt,” Simpson recalled. “Well, you’re not gonna check this car,” Moursund said. Realizing he had a touchy situation on his hands, Simpson summoned his captain and the local warden to try to persuade Moursund to cooperate. While Sprott and Moursund talked, Simpson took a closer look at the vehicle. In addition to the hired help, Simpson recognized A.W. Stubbs, a Johnson City banker. The warden couldn’t get a good view of the other man, who kept his hands over his face as if in deep reflection. The game warden was referring to Senate Majority Leader Lyndon B. Johnson. With no further discussion, Moursund suddenly got behind the wheel of the car and drove off quickly in the direction of a gate leading to his ranch house. Simpson’s first instinct was to shoot out a couple of Mour­sund’s tires and hold him and the other two hunters for a U.S. Fish and Wildlife Service agent, but Sprott nixed any use of the World War II-surplus .30-caliber carbine the Travis County warden kept in his trunk. But the captain did authorize Simpson to go ahead and file state charges against the men. The three wardens then drove to Johnson City, where Simpson filed complaints against all three men with the local justice of the peace, who said he’d set a hearing on the matter in the morning. Indeed, though the charge against him was dismissed, Johnson did everything he could to get Simpson fired from his job and, failing that, to get him transferred out of Travis County. When longtime Game and Fish Commission Director Howard Dodgen lost his job with the creation of the new Texas Parks and Wildlife Department in 1963, he later said he believed his removal stemmed from his refusal to intercede in the Simpson-LBJ case. Former Game and Fish Commission member J.W. Elliott of Mexia told the Texas Observer that Johnson had also threatened to cut any federal aid the department received, but that didn’t happen, so far as is known. Even though Gov. John B. Connally appointed Mour­sund to the new Texas Parks and Wildlife Commission, Simpson held on to his job and survived an effort to transfer him to Cleburne. Meanwhile, following the assassination of John F. Kennedy on Nov. 22, 1963, in Dallas, Johnson became president. When Johnson ran for a full term in office in 1964, West Texas historian and ultra-conservative J. Evetts Haley came out with a book called A Texan Looks at Lyndon. In it, for the first time, he exposed a national audience to the story of Simpson’s effort to get LBJ fined over a game law violation. As Johnson followed the election returns in his suite at Austin’s Driskill Hotel, downtown filled with tens of thousands of people celebrating his landslide victory. Given what had happened in Dallas, security was tight. The Austin Police Department, Travis County Sheriff’s Department, Texas Department of Public Safety and the new Texas Parks and Wildlife Department all had officers armed with high-powered, scoped rifles hidden away atop various downtown buildings just in case. One of those officers was Simpson. The president likely never knew that the game warden he had been trying to get fired was among those providing his security that night. From Simpson’s standpoint, he was just doing his job, same as he had been back in 1956. And with the growing war in Vietnam, Johnson soon had plenty of other things to worry about besides a Texas game warden. By the time Simpson retired on Aug. 31, 1982, with 34 years of service, the dove hunting incident had been largely forgotten. Despite chronic health issues tracing back to a lung injury he had suffered years before as a national guardsman, Simpson laughingly used to tell me he planned on outliving Johnson (in typical Simpson fashion he referred to the former president a bit less graciously than that), and he did. LBJ died of a heart attack in January 1973, but Simpson made it another 12-plus years, dying of lung cancer in the spring of 1985 at 66.